I’m sure that I don’t have to tell you that Halloween is upon us, and that means big decisions about costumes. This year’s choice became an easy one for Kiki, though, with the appearance of everyone’s favorite adventure gal, Dora, all grown up. 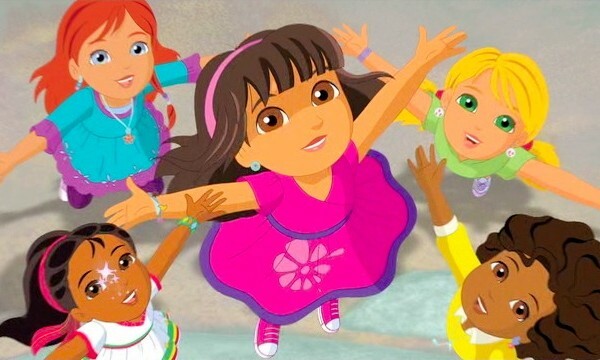 If you don’t happen to have your finger on the pulse of the latest innovations in children’s media, let me explain — Nick Jr. has a new show called “Dora & Friends,” which is geared more toward older kids in a clear attempt to hold onto their audience a little bit longer. The new Dora has ditched the backpack and map in favor of a smart phone with GPS. No joke. 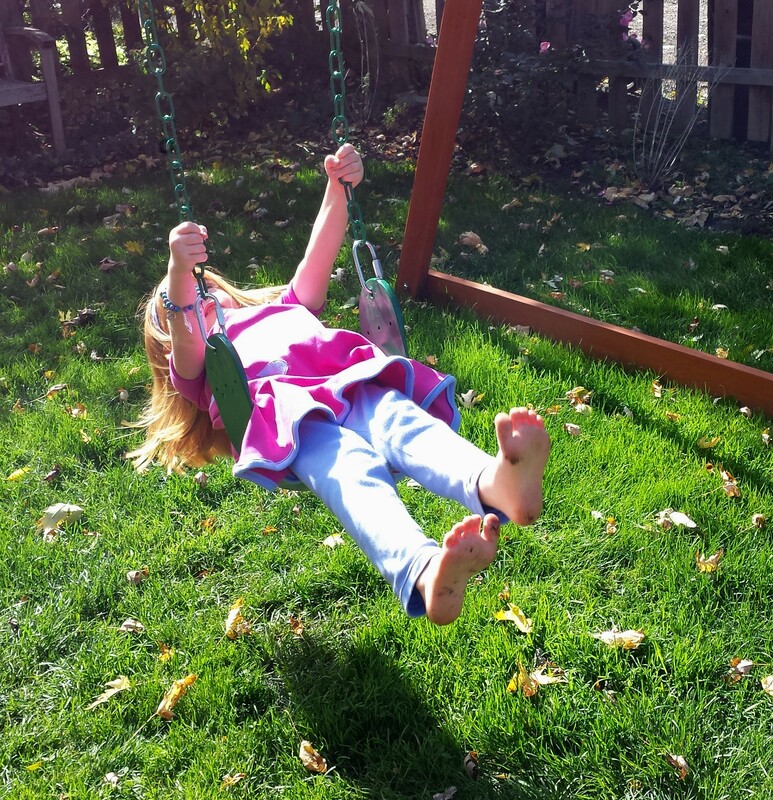 She no longer hangs around with animal sidekicks — she has lots of tween pals now. Kiki is transfixed. She MUST be Dora!!! 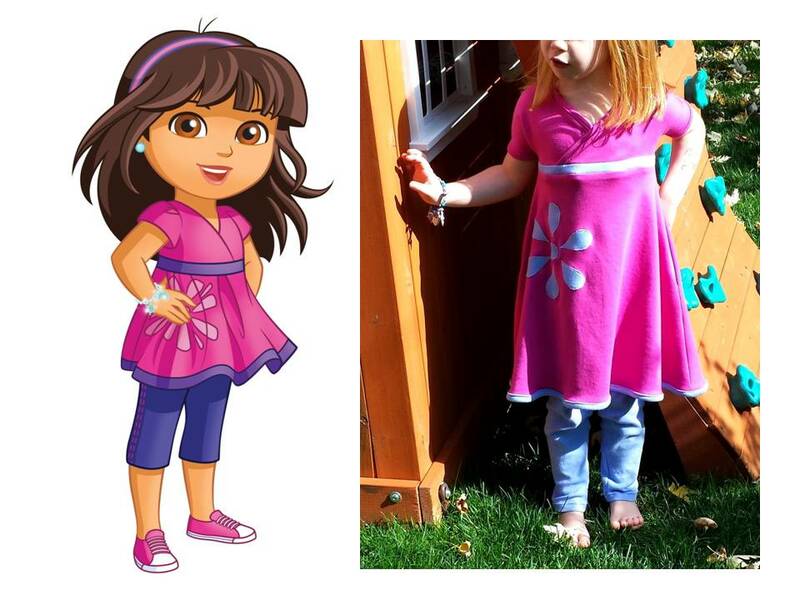 I took a look at Dora’s new dress and was pretty sure I could come up with something faithful enough in detail for Kiki’s unwavering demand for accuracy. I had a pattern from Jocole on my hard drive that I bought ages ago and never made, called the Crossover Tunic, which comes in both tunic and dress lengths. It’s perfect! 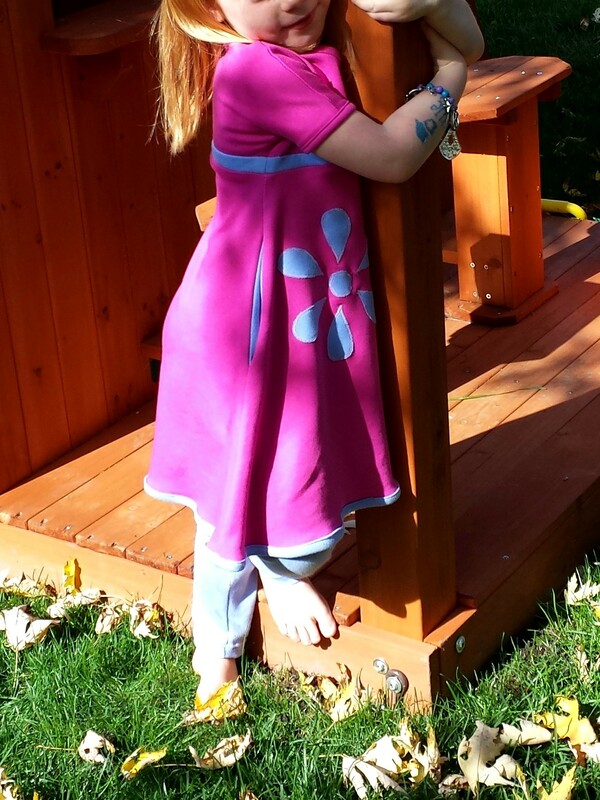 I made the tunic length and added 3 inches to the hem. (I probably could have cut the dress length to achieve the same result.) 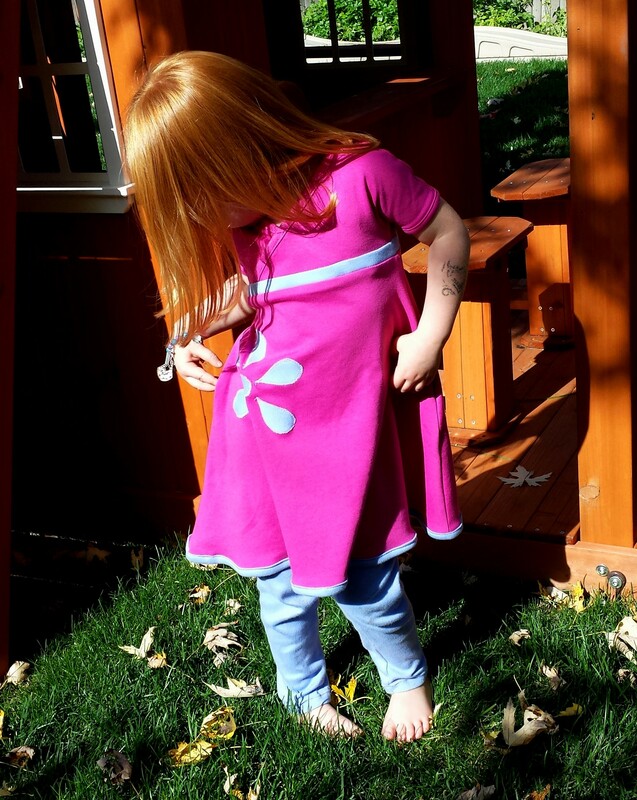 The skirt is designed to be pretty straight, so I angled it out as far as my 1/2 yard of 58″ fuschia interlock would allow to give it the appropriate Dora-like swing. 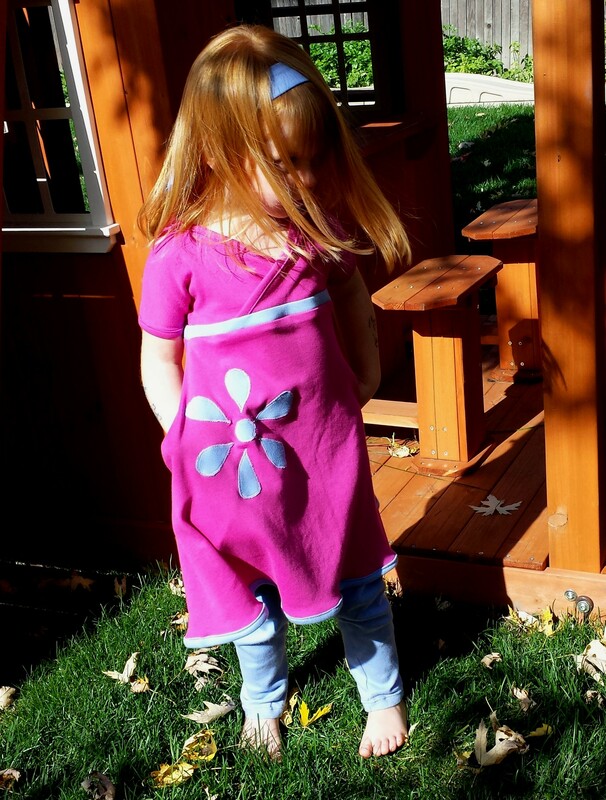 On Dora’s legs, you see Oliver & S Playtime Leggings in periwinkle interlock. I’d never made leggings before, and these are pretty cool. 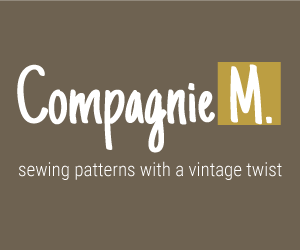 There’s only one pattern piece, and they sew up in a flash. They aren’t skin tight like the Old Navy variety, and you can make them in really nice, thick knit which will keep little legs toasty all winter under skirts and such. I’ll definitely be making lots more of these — maybe some in sweatshirt knit. I’m also going to try out some Go To Leggings for myself. Why should the little people have all the fun? 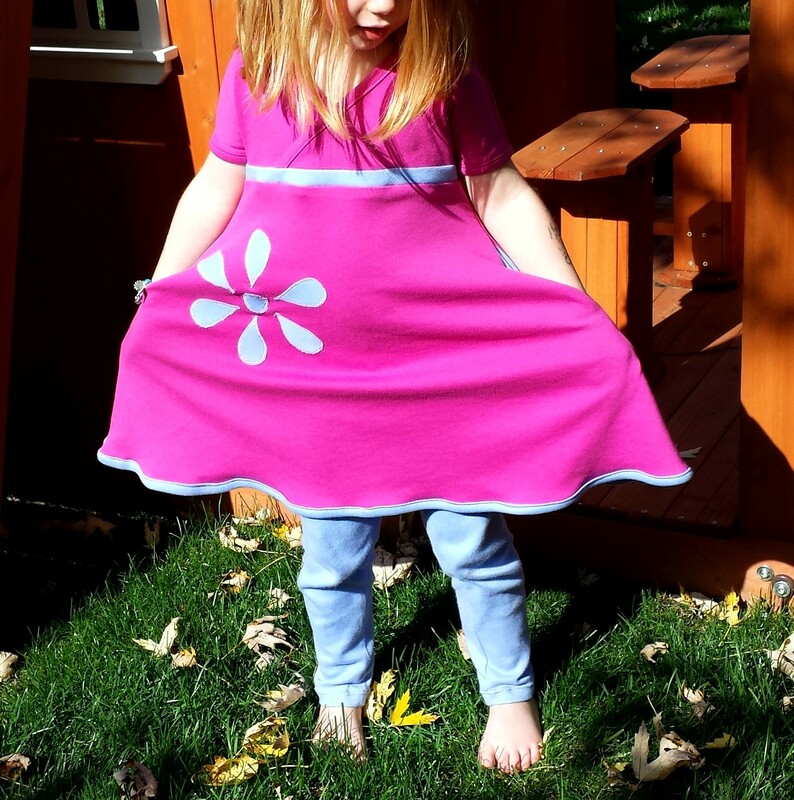 There was no way I was going to get away with making a Dora dress without the flower on the side of the skirt. So, I did a Google search, found a great tutorial from Sew Mama Sew and got ready to try my hand at applique. It’s so easy! All you need is fusible webbing and an iron. When I finished up this flower that looks pretty darn close to the Dora original, I felt like a genius! The only real hiccup I encountered in this endeavor was adding the purple band at the waist. This isn’t included in the pattern, and I don’t think I did it in the most practical way. I cut a 2 inch wide strip of purple knit and pressed it in half longways. I then lined up one of the raw edges of the strip with the raw edge of the bodice waist and sewed it onto the bodice at the crease of the strip. Then, I pressed the strip down with all the raw edges aligned and attached the skirt through the three layers of bodice and strip. I pressed the seam allowance down toward the skirt, since it’s pretty thick with all those layers. In the end, the seam allowance is too thick and makes the waist seam stick out and to go all wavy. I tried pressing the seam allowance up toward the bodice and top stitching with a zigzag, but that didn’t help at all. If I had it to do again, I’d attach the strip to the bodice the same way, but would trim the seam allowance under the seam to reduce the bulk. I’d attach the skirt to the bodice piece only, and then would press the bottom raw edge of the strip under at the waist seam and top stitch it down. This would leave only two layers of seam allowance, with way less bulk. I considered taking the whole thing apart and trying this method — but really, that would be crazy overkill. 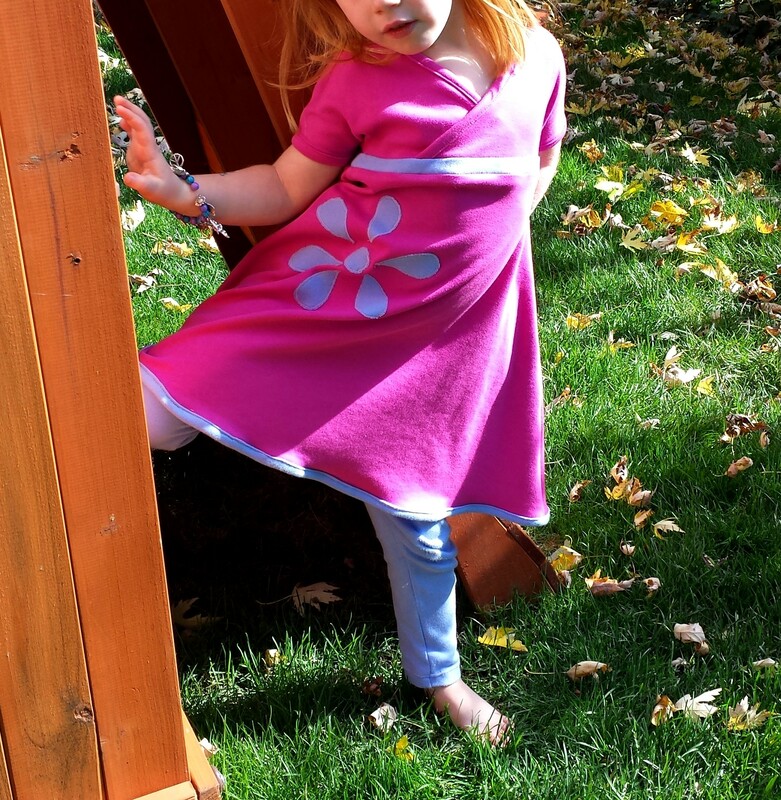 Kiki LOVES this dress and has vowed to wear it every minute of everyday. Not only would it be silly to do a ton of seam ripping and futzing around for unnecessary perfection, but I’d never be able to get it off Kiki’s body long enough to do it! Sometimes, you just have to let it go. On to the happier features of this creation. Since Dora no longer has a backpack to tote her stuff in, Kiki and I decided that she totally needs pockets for her smart phone and other sundries. I added some in-seam pockets in periwinkle (my favorite feature). Of course, there needs to be a headband — just a 3 inch wide knit strip sewn together as a tube, turned right side out, and tied. Lastly, and most importantly, there’s the magical charm bracelet. Oh yes. Dora uses it to conjure all sorts of solutions to problems — don’t we all need one of those? Kiki and I had a lot of fun picking out charms and beads at Joann’s. 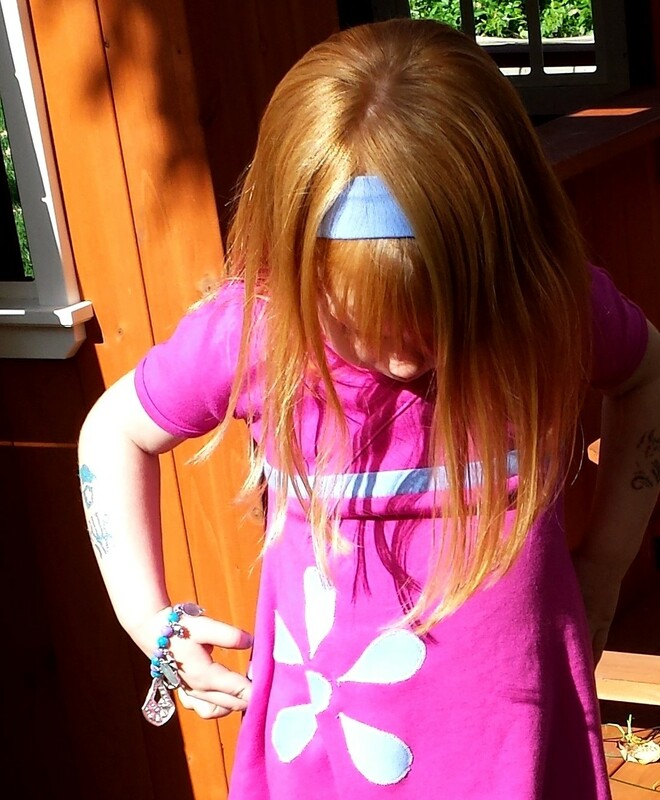 This bracelet was fabricated a week or two before the dress, and has been worn everyday to preschool (and everywhere else). We’ve already had to tearfully replace a charm or two. I think we’ll be safe this year from the dreaded last minute costume change of heart — you know, when you slave away to create (or locate and purchase) the perfect requested costume, only to have a huge crisis on October 30 when your precious little one decides that she would never have asked for such a ridiculous and hideous costume and demands something else. Hope you’re safe, too! By the way — I haven’t mentioned Lulu’s costume here, not because she doesn’t have one, but because she amazingly requested to be the Oz Wicked Witch weeks ago and is sticking to it. The kicker — Kiki was a witch last year, and Lulu fits into the costume. YEEEESSSSSS!! !